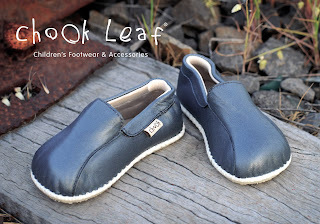 The Chook Leaf brand has become the name synonymous with comfortable children’s footwear. Designed in Australia since 2005 it has gained the reputation as the comfortable fun brand of shoes that children love to wear. 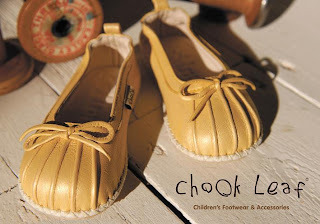 Chook Leaf shoes are hand made in the softest lambskin leather. They have a flat inner sole and wide toe circumference that mimic’s walking in bare feet. They are designed for fast growing feet that want to have the freedom to develop without the restriction of hard synthetics and rigid soles. The non slip soles add the benefit of safety to children who are unsure on their feet. All of these elements combined bring you peace of mind when choosing shoes for your child. Each new range brings fresh and innovative designs for both boys and girls that include contemporary styling and seasonal colours. Melbourne based designer Rie Southwell knows about style, functionality and children’s feet. With twenty years experience in the design of women’s fashion and children’s footwear the mother of three now takes great delight in watching her kids grow and enjoy their childhood in comfortable and fashionable Chook Leaf shoes. This unique brand is available in boutiques around Australia and enjoys the repeat purchases from customers whose children won’t wear anything else.